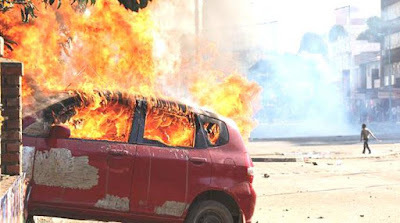 THREE people were killed, while several others were injured when MDC-Alliance supporters went on a rampage destroying property, torching vehicles, blocking roads and attacking people in Harare’s central business district (CBD) yesterday. Some pedestrians and vendors were robbed in the fracas. The rowdy MDC-Alliance gang poured into the streets at around 10am and continued disturbing peace into the afternoon. They besieged Zimbabwe Electoral Commission (ZEC) offices and National Results Centre as well as the Harare International Conference Centre. Security institutions have since been activated to thwart any disturbances. Police said they were fully aware of the instigators of violence, adding that the full wrath of the law would be applied against them without fear or favour. The police said they were keen to interview Mr Tendai Biti and Happymore Chidziva of MDC-Alliance in connection with the disturbances. Police chief spokesperson Senior Assistant Commissioner Charity Charamba last night said: “We, as the Zimbabwe Republic Police, wish to express our sincere and deepest condolences to the bereaved families. “The ZRP is currently investigating the circumstances surrounding the deaths of these three people and the injury of other people as well. She said as investigations continue, the public should remain calm and peaceful. “The Zimbabwe Republic Police is also currently seized with viewing video footage of political party leaders who continue to urge members of the public to engage in cases of violence. We want to make it clear that inciting violence is contrary to the law and these people will be arrested. “The ZRP would like therefore to condemn in the strongest terms, acts of hooliganism and vandalism that occurred in the Harare central business district. “All efforts to maintain peace, law and order have been marred by ugly scenes of violence and surely the loss of lives under any circumstances is not acceptable. “Sanctity of human life is very important and that should be very clear to all those instigators of violence,” said Snr Asst Comm Charamba. She said all those who torched vehicles, assaulted vendors, took their wares, damaged shops and conducted unlawful gatherings will be arrested. “Those who were involved in these acts of violence also besieged the Zimbabwe Electoral Commission, National Results Centre as well as Harare International Conference Centre. They caused massive destruction of property which include shops, and we are currently assessing the extent of damage. “The ZRP managed to disperse the marauding groups but damage had already occurred. The ZRP would like to warn that such criminal acts are grievous, unacceptable and are going to be met with the full application of the law. In the same vein we are warning political party leaders who have instigated their followers into committing acts of violence that the long arm of the law will certainly catch up with them,” she said. Snr Asst Comm Charamba said security institutions were monitoring the situation and were fully aware of the inciters and perpetrators of this violence. “Meanwhile we are keen to interview Mr Tendai Biti and Happison (sic) Chidziva of the MDC Alliance. We are inviting them to CID Law and Order in Harare so that they can assist the Zimbabwe Republic Police with investigations. We are urging members of the public to refrain from committing acts of violence. “We want to inform the nation that the Commissioner General of Police has invoked the provisions of Section 37 (1) of the Public Order and Security Act Chapter 11.17 and approached the Minister of Home Affairs and Cultural Heritage (Dr Obert Mpofu) to request for the assistance of the Defence Forces for the suppression of the commotion and disturbances in Harare Central Business District,” she said. Snr Asst Comm Charamba urged the public to respect the rule of law, refrain from engaging in acts of violence and to stay at home instead of causing lawlessness in town. Snr Asst Comm Charamba said the security forces were on high alert and had deployed their sister institutions to assist in dealing with this violence that is ongoing. Acting Prosecutor General Mr Kumbirai Hodzi condemned the violence by the MDC Alliance saying his office was ready to efficiently and speedily prosecute the perpetrators in accordance with the law. “We would like to encourage members of the public to desist from engaging in these acts of violence relating to the ongoing announcement of the 2018 harmonised election results. “Any behaviour that is contrary to the same will attract the full wrath of the law. In this regard, the National Prosecuting Authority together with key stakeholders, has put in place contingency measures to ensure the speedy prosecution of all election violence related offences,” said Mr Hodzi. The prosecution boss appealed to the citizens to maintain the peace that prevailed during the harmonised elections. Those who complain of constitutional breaches, the Acting PG said, should follow the lawful procedures. “Members of the Public are being reminded to follow proper procedures in expressing their constitutionally guaranteed freedoms. “I am warning the general public that the National Prosecuting Authority will not hesitate to institute and undertake criminal proceedings against anyone who is arrested and brought to court on charges pertaining to electoral violence,” reads the statement. The Chief Justice Luke Malaba has since set up special courts to deal with political violence and intimidation cases. At least 70 magistrates were designated to preside over the special cases in all the provinces of Zimbabwe.